I was really excited when Crayola told me they had a new line of supplies, Take Note! for the school year. They sent me some Take Note! gel pens and erasable highlighters in exchange for an honest review. What is so cool about this new line? Well let me tell you...a lot. Read all about them in this post. I know I say that about all Crayola products, but I really mean it. I would not say I loved it if I did not. The great thing about this post is you have a chance to win these too! 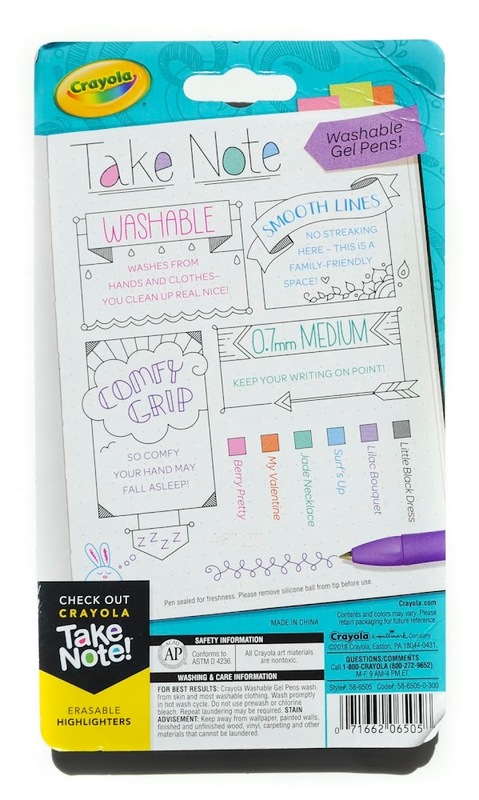 There are 3 different products in the Take Note! series. There are 6 and 14 packs of Crayola Take Note! Gel Pens and 6 Crayola Take Note! Erasable Highlighters. Crayola labeled the colors on the back of the box, which is amazing, because it bothers me when art supplies are not named. The colors are creatively named as opposed to most crayon colors that are traditionally named (ie red and blue). 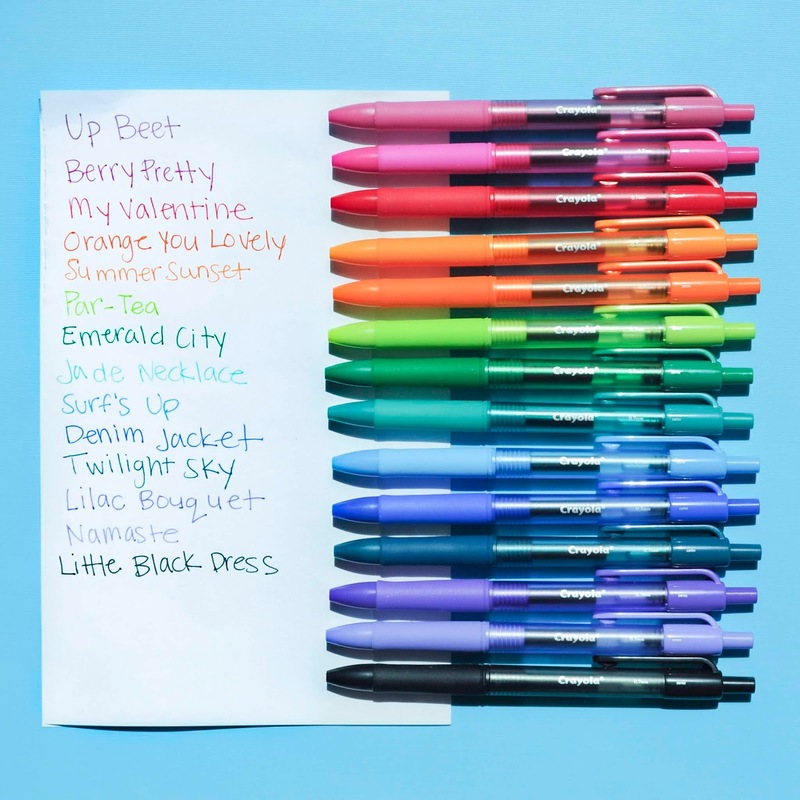 My favorite Gel Pen colors are Denim Jacket and Little Black Dress, because black pens and the denim color. I would definitely buy both of these products. The gel pens are more pen like then the Gel Pens in the Signature Series. They work better too. 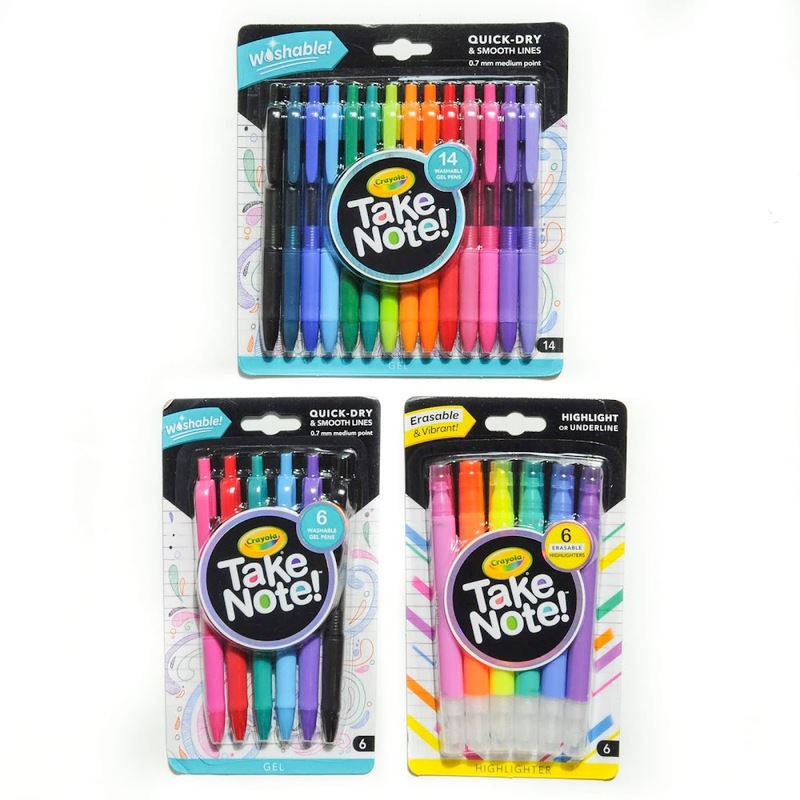 These pens have minimal bleed through and are great for bullet journaling, writing lists etc. I use mine for my planner. The colors are very vibrant. The pens came with a silicone ball attached to the tip to keep the pen from drying out. All the pens were super fresh except one for me. I would definitely recommend them and will buy more when they run out. One time I bought some gel pens in New York City and used them a lot. I took them EVERYWHERE. I was visiting family when I lost them and could never find them in the store again. These pens are just like those missing pens. I will definitely keep them close so I do not lose them again. The coolest thing about the highlighters is the magical eraser. To the average Crayola user this may seem like new technology, but it has been around for years. I love that Crayola is packaging and marketing them in a different way. My kids were amazed when I was making the picture above, and made pictures of their own. How did Crayola make an erasable highlighter? It's a chemical reaction on the paper. The eraser dye reacts with the color dye to "erase" the old color. I found that the any eraser would work on any other color except the yellow one. It had to use its own eraser. 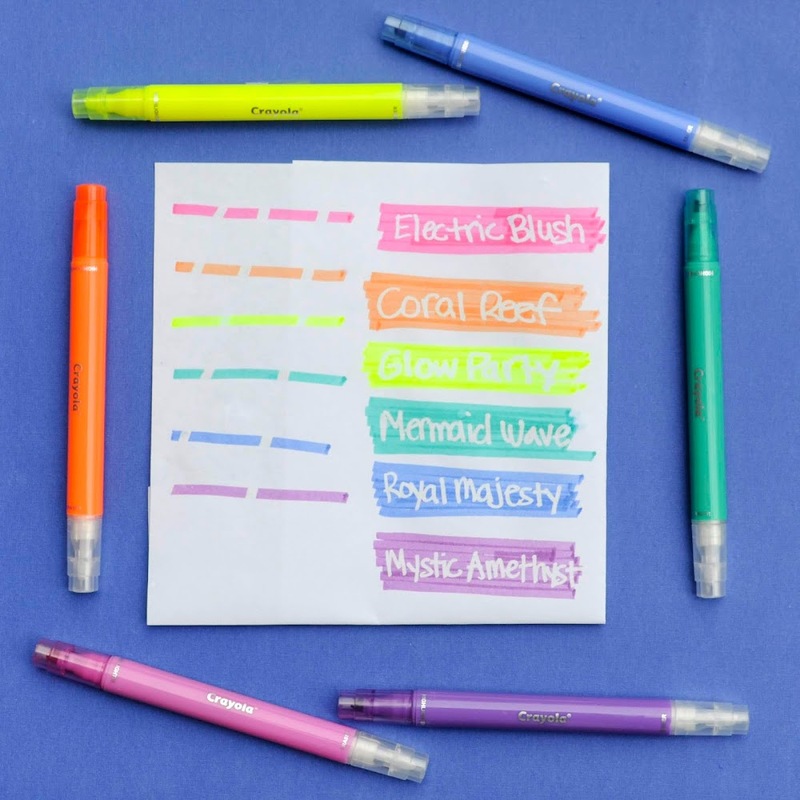 These highlighters can be useful and fun for kids and adults alike. The only thing is once something is "erased" it can not be colored over again, unless the yellow is used. But then if the yellow is erased nothing will color over it. I would definitely recommend both of these products and can not wait to use them for years to come. The only thing I would change is the packaging. I would package them in a box instead of plastic. It is hard to collect items in plastic because once they are open the packaging is destroyed. Now the exciting part! 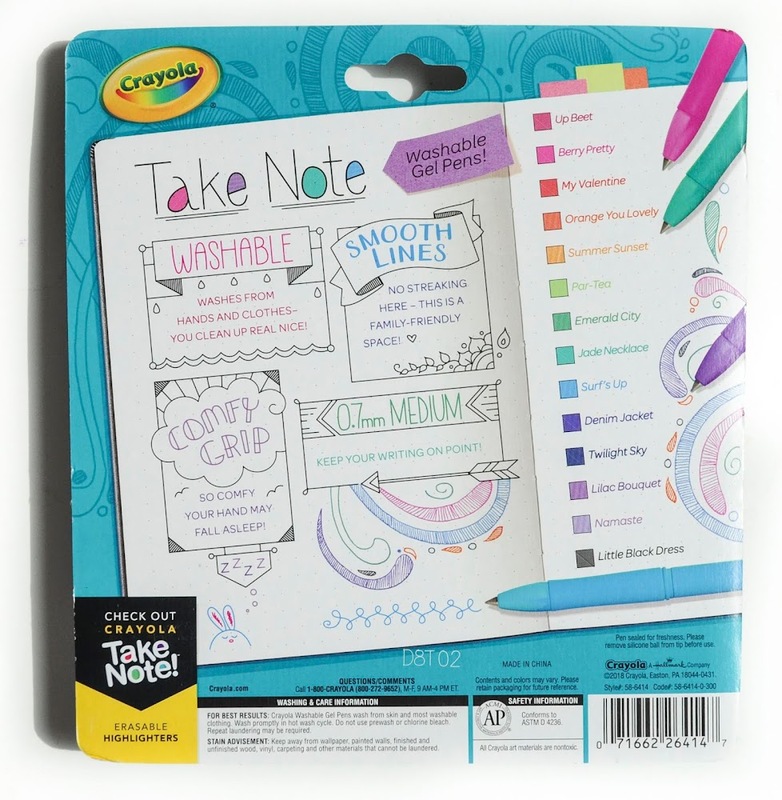 Crayola has offered one my readers the chance to win their own set of Take Note! supplies. Enter below and good luck! Contest runs from 8/22/2018 to 8/30/2018 12am EST. Must be 18 to enter. US residents only. Void where prohibited. Winner will be randomly chosen. Winner will be notified by email. Will need to provide email address to claim prize. By entering, entrants confirm that they are 18+ years of age. Giveaway is sponsored by Crayola. This promotion is in no way sponsored, endorsed or administered by, or associated with Facebook, Instagram, Twitter, and YouTube. Labels: 14 Count, 6 Count, Crayola, Gel Pens, Highlighter, Reviews, Take Note! What cool new products!! I love the neon colors! I love a good gel pen! Entered and fingers crossed!! I'll add these to my birthday list! I didn't see these products when I went back-to-school shopping. Maybe because I wasn't actively looking for them but will try to find them this weekend. This would be so awesome to have. We have always loved crayola. And the fact that there are still colors out there to be found ... is awesome. I remember us making such a big deal last year trying to figure out what the name would be for it! This would be perfect for my oldest that is in middle school! This would also be helpful for the college courses I am starting! 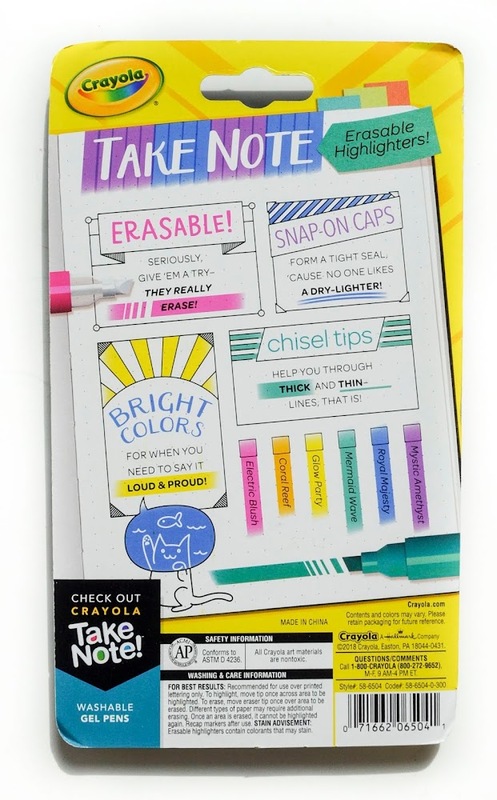 I need to check out those erasable highlighters those sound awesome! Crayola has come a long way! I love this! I am obsessed with gel pens, I would love to win this. Love gel pens! Awesome colors. The erasable highlighters look great, never would've thought highlighters would ever come with erasers. Cool idea. Thanks for the opportunity. These look so neat! My daughter and I must try.